Neal Systems is pleased to announce its new partnership with Spirax Sarco, one of the most recognized control valve companies in the world. We already provide superior pressure, flow, level, and temperature solutions from Schneider Electric (Foxboro and Eurotherm) for customers doing flow control of steam and process applications. We are excited to marry our existing mastery of those solutions with the expertise and products of the Spirax team. Why did we choose Spirax Sarco? Besides the powerful Spirax Sarco name, they recently made a unique change as to how they provide control valves. They listened to what customers really wanted. The answer wasn’t any special technology — they instead recognized that because of the speed and simplicity of Amazon, customers expect (and need) valve deliveries to be fast. 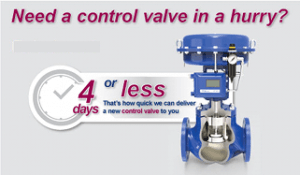 As a result, they have totally revamped their methods and processes so that they now ship out 90%+ of their valves within four days. FOUR DAYS. That’s amazing, since valve shipments are often measured in months. We’d like the chance to earn your business. Please give us a call to take a test drive with the Neal Systems team, powered by Schneider Electric and Spirax Sarco.